Stilettos Diary: Balmain Effect - Black and White. Greatest thing that could ever happen was Oliver Rousteing joining as the designer at Balmain. His work is beacon of art, glamour and class. Inspired by his runway spring and Resort collection, I put together this week's outfit. That's right, make every day your personal runway in budget is the theme of today's blog post. Alright, I have been blabbing about Balmain collection. Here's sneak peek of the collection as seen this season. As you can see, a lot of print mixing and pastels dominated his collection. So decided to put together a print on print on print outfit inspired by his amazing work. I would any day wear almost all of his outfit. The collection is just awesome but I don't believe in spending a bomb! Most of the time I check out the runway shows and think of wearable trends I can incorporate into my outfits which flatter my body shape and size. I paired my polka dot shirt with stripes skirt and zebra print kitten heels. I paired a similar zebra print necklace matching my heels. Completed the look with a bit my style by adding red belt, yellow nail polish and messenger bag (I love oversized belts, perfect to hide the flab. Cat- eye sunglasses are here to stay. To match the mood and theme of the outfit, I added contrast black and white cat eye sunglasses. Voila! Runway inspired outfit which you can actually wear every day and still not look overdressed. A short blog post today, a welcome change from heavy dosed outfit posts. I will not ramble more. Do let me know what you think of the styling and of course what you would love to see more on the blog. Shopping tip: Now that sales everywhere, if you don't have stripes in your wardrobe, I think it is going to be the best investment this season along with a pair of silver heels. Silver will make a huge comeback this season. P.S. I did iron this top, but apparently me and ironing clothes don't go in the same sentence. I keep running around and meddling with my shirt so much ultimately it looks not ironed. every one is looking so sweet. I really like your choice. so great job. beautiful pictures, great combination of three styles in fashion .... polka-dot shirt, skirt style stripes and even shoes. I love your heels a lot! They are awesome! wow love the spots! xO! 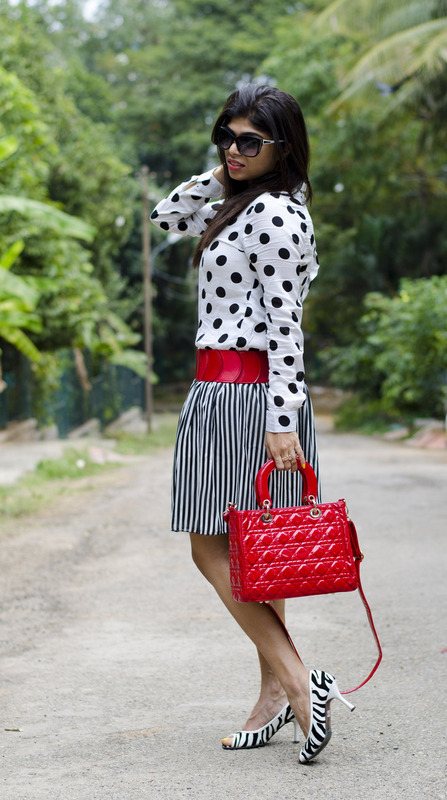 LOVE the pattern mixing, Megha!! I love the mix of pattern! Great mix of black and white with hits of red! You OWN the black and white! It looks stunning on you. And I love how you incorporated the pops of red. Stunning. Loving the dots especially and your blog in general! I like how you mixed the stripes and polka dots! Two of my favorite prints :) Thanks for checking out my blog. Black, white, and RED is what makes this work! Especially the belt! I love how you accented the black and white with the red pieces! Love the contrasting black & whites with red accents! Look awesome! It looks great, and the red you added to it just really finished it off perfectly. I am not very good with an iron either, so I just don't really bother! This is such a perfect outfit, I love how you mixed the patterns!!! Hi Megha - thanks for visiting my blog. You have great style. These outfits are amazing!